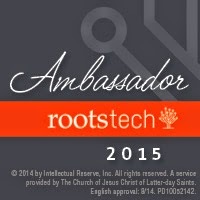 Like many of the other RootsTech bloggers this year, I chose not to blog from the Conference itself. There was just so much to see and do, what with having two Conferences combined (RootsTech and FGS), a much much bigger exhibit hall than previously, and so many genealogy friends and colleagues to network with - including a large number of Australians visiting this year. I had originally intended to post all my RootsTech blog posts last week, but having arrived home, I promptly fell ill with a nasty cough / cold virus which totally knocked me out. So I'm afraid I'm about a week late with these posts. This one is just an introduction and overview. In the two years since I last attended RootsTech, I seem to have become more well known in genealogy circles, despite not being a very active blogger. I guess its my quite large following on Twitter. Several people I spoke to said "oh yes I know your name" which was very nice, even though sometimes I didn't always recognise theirs. A case in point was Hilary Gadsby, from Wales, who had travelled out on her own to RootsTech for the first time; an enthusiastic genealogist, with ancestral roots in Hampshire, Hilary and I followed each other on Twitter, but she hadn't really appeared on my radar before; here is Hilary's blog, GeneMeet. I also enjoyed meeting Jenny Joyce, a professional genealogist whose blog is the aptly named Jennyalogy, whom, I was rather embarrassed to discover, I didn't follow on Twitter (I do now, Jenny!). It was lovely to meet both Hilary and Jenny, as well as reconnect with many other old friends. The Keynote Sessions were spectacular, as usual. Tan Le's story and her storytelling skills were simply amazing. I would recommend watching her session. You can find it here (at 59 mins in). I really didn't think I would particularly enjoy seeing either Donny Osmond or Laura Bush, but they both blew me away, and especially Laura Bush when her daughter, Jenna Bush Hagen interviewed her on the couch. Wow, I have some way to go in my interviewing skills! It's a shame that this was the only Keynote session which is not available on the live recordings. The other recorded sessions, including Keynotes and some classes, can be found here. The major players, Family Search, Ancestry, MyHeritage and FindMyPast, all had major announcements to make at RootsTech and I will be reporting on some of those in forthcoming posts, especially the announcements which relate to the UK genealogy community. I will also be taking an in-depth look at what's new in the world of DNA in genealogy, with all the main players (Ancestry, FamilySearch and FindMyPast) again announcing something new in this field. Rosemary, it was an absolute delight to meet you! You sat in front of me on the first day and gave me your card, which I shall surely keep. I love your wrap-up in this post, for it helped me to re-live the wonderful event all over again. It was good to meet you, Peggy, and thanks for tracking down my blog. I have more blog posts to come, so do keep an eye out. It was wonderful to get to know you, Rosemary. It was really good to get to know you too, Jenny, and I hope you had a good trip back. Until next time then! It was great to get to meet you Rosemary. I look forward to your other posts. It was good to meet you Pauline, and to put a face to a name. Sorry about the delay to the other posts, I've been hindered by illness since I got home, but will get there eventually.